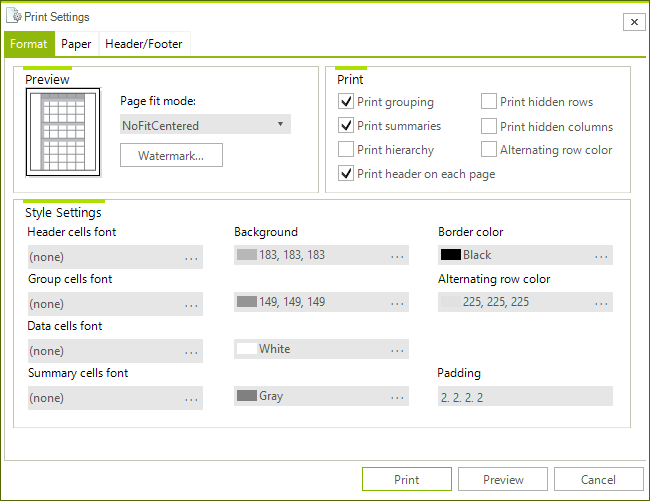 The GridPrintSettingsDialog is allows the end user to edit the print style settings of RadGridView, the settings of the printed paper and the header and footer of the printed document. The first tab (Format) of the dialog is specific to the RadGridView the other two tabs, namely Paper and Header/Footer, are discussed in the Printing documentation section. The Format tab is divided into two sections. The first sections shows a simplified preview of the result. It also holds the editor for the PrintFitWidthMode and a button which opens the WatermarkPreview dialog. The second part holds the settings for what should be printed and the font settings for the different type of cells - header, group, data and summary cells.